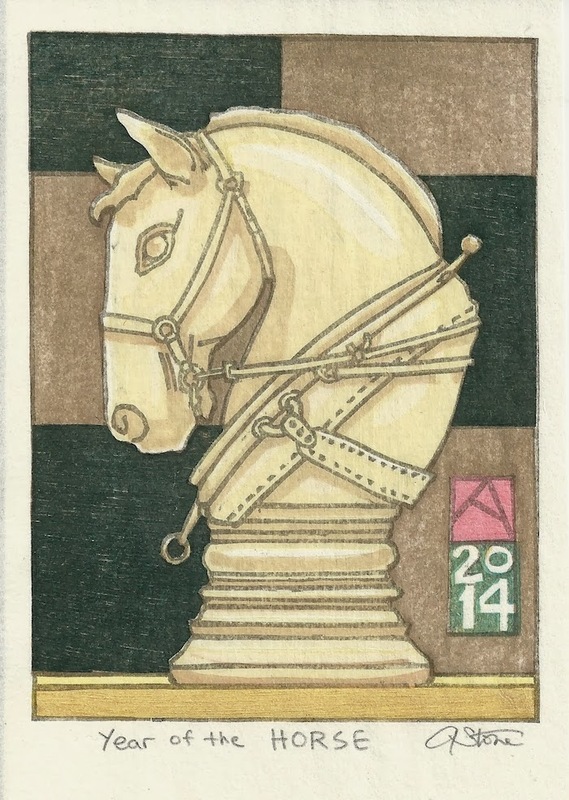 2014 is the Year of the (wooden) Horse. 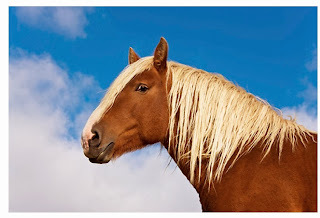 I don't follow astrology so I can't really elaborate much about what the Horse is supposed to represent. For me, as always, the animal zodiac has allowed me the impetus to play with an animal image as I continue to explore the art of moku hanga. I chose to make my horse into the "White" knight of the Chessboard but with the added twist of making my horse a working animal. 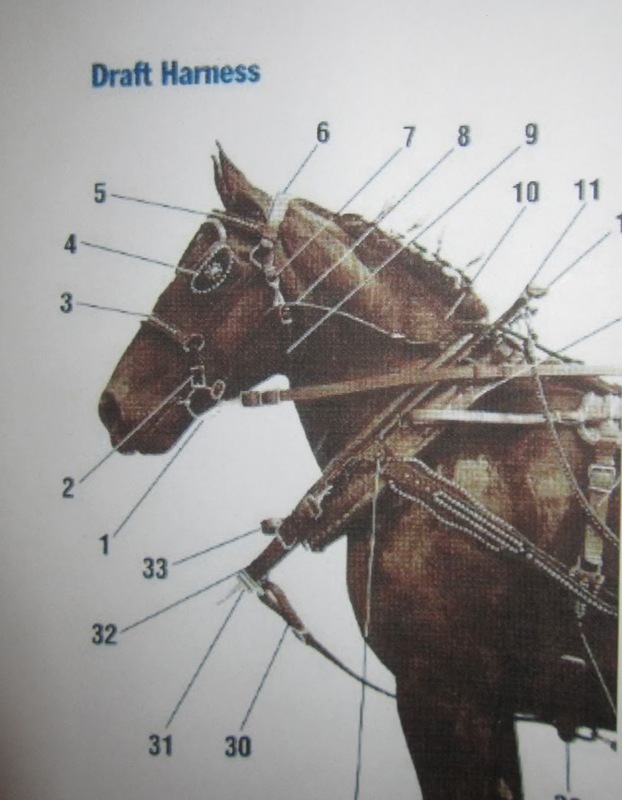 Since my secret dream would be to farm with draft horses I added the collar and hames of the American style of harness in honor of the thousands of farmers back home who still insist on working the land with draft horses and ponies. I pulled out back issues of the "Small Farmers Journal" which is full of articles about draft animals and has lots of photographs of working horses and ponies. I cobbled together a composite from some ads for leather harness and color photographs of teams of horses pulling plows and harrows. (It is also a great resource for books and videos, conferences, workshops, internships and manufacturers of new horse-drawn machinery). Few people are aware how many farms are still worked using animal power. More surprisingly is how many people are alarmed or threatened by the concept. One hears often how "you can't turn back progress" or how we need industrial agriculture to feed the world's hungry....But many would argue that farming became unprofitable when animals left the farm and were replaced by tractors requiring parts and fuel, and chemical fertilizers became necessary as the original source of farm fertility---crop rotation coupled with animal manures gave way to monocultures of wheat, corn or soybeans and farmers mortgaged their farms to buy larger and larger tractors to farm larger and larger acreages in the hopes that a profit could be made if they could only farm even more land. But despite all this, roughly 400,000 draft horses are still bought and sold in the USA each year. Large numbers by the Amish and Mennonite communities but there are others; old time farmers and young ones too returning to the land in the hopes of finding again a way of life that is tied to the rhythm of nature. I grew up in the suburbs of Miami and never saw a draft horse until I was 45 years old. Here, the oxen that once pulled plows in Tuscany are all gone except those being raised for meat. There are only a handful of farmers in Italy using horses. Many more in England, France and Germany. But that's pretty far and I'm a little old to be starting from zero and the absence of local models to learn from means that my dream is likely to remain one. 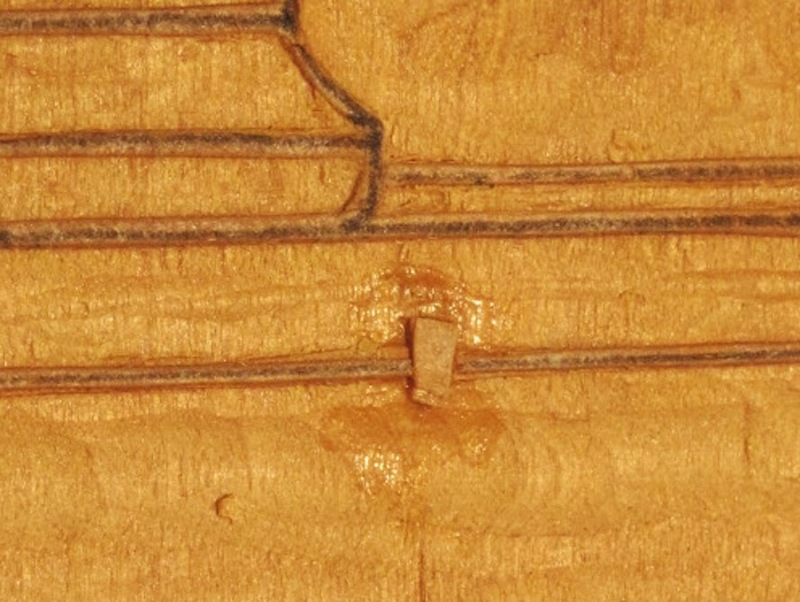 The keyblock was carved from a small block of boxwood. 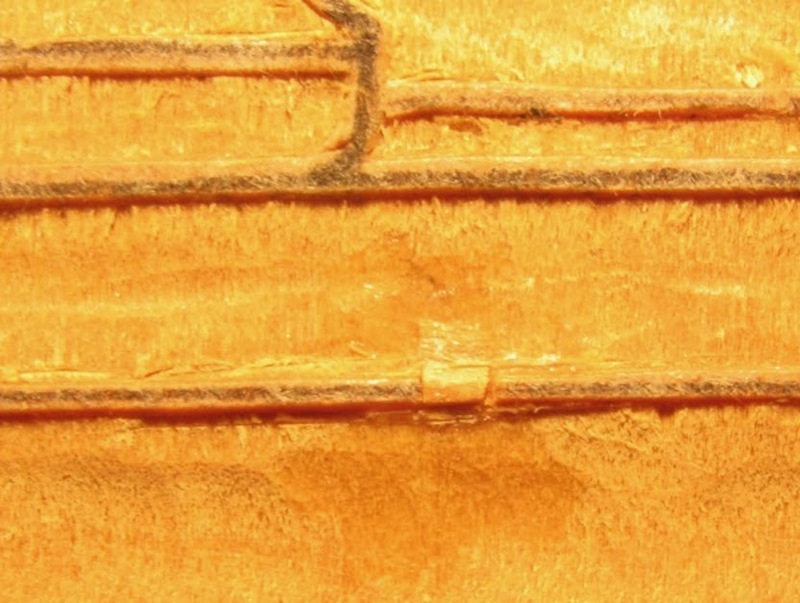 The color blocks were carved from shina and okoume marine plywoods. Baren Forum Chinese Zodiac exchange. 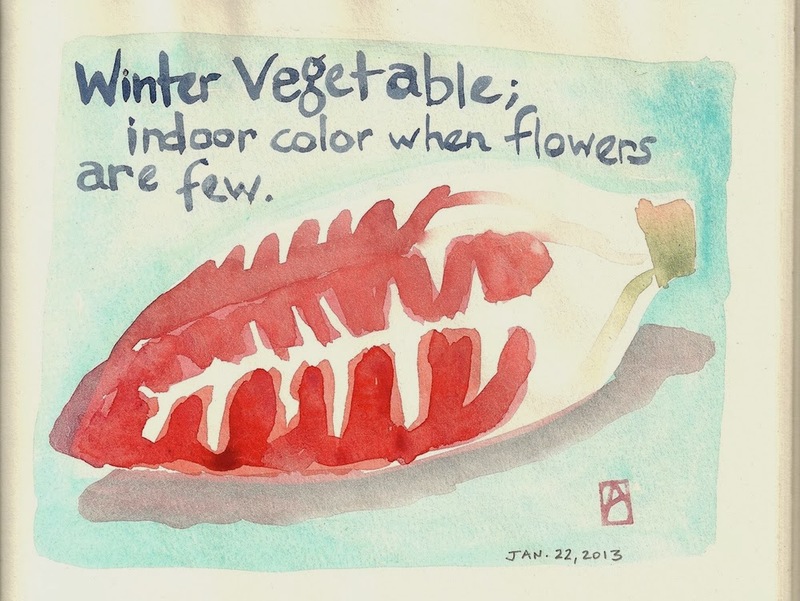 "Winter Vegetable; Indoor color when flowers are few" 4"x6" watercolor and sumi on Washi. I joined the local Japanese cultural association; LAILAC which aims to introduce and foster an understanding of Japanese arts and culture to Italians. There was a large fair in December with demonstrations of dance, ikebana, drumming, cooking, calligraphy and a special section set up to show people the art of ETAGAMI; simple drawings of everyday life, usually coupled with a short phrase or comment that are shared with other--usually through the mail. They are painted on weakly-sized washi using a brush held vertically from the end so perfect control is impossible and the inevitable bleed of some of the ink and color into the paper are part of the appeal. So, with instruction, anyone who wanted to participate was allowed to draw a quick sketch with sumi and paint in colors using watercolors. I left mine with the hosts but suscribed to their ETAGAMI exchange, which would pair me up--like a pen-pal--with a Japanese participant to exchange monthly Etagami. They are handling the actual bulk mailings and the only requirements were that the simple phrase to accompany the drawing be written in JAPANESE. Here's the Etagami I received yesterday from Japan. 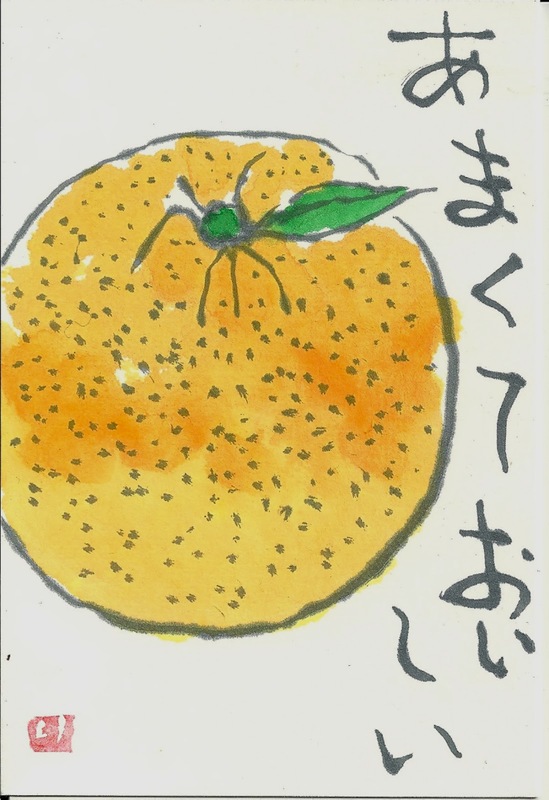 I can't read it and haven't had time to have it translated but it is a cheery orange or mandarin. 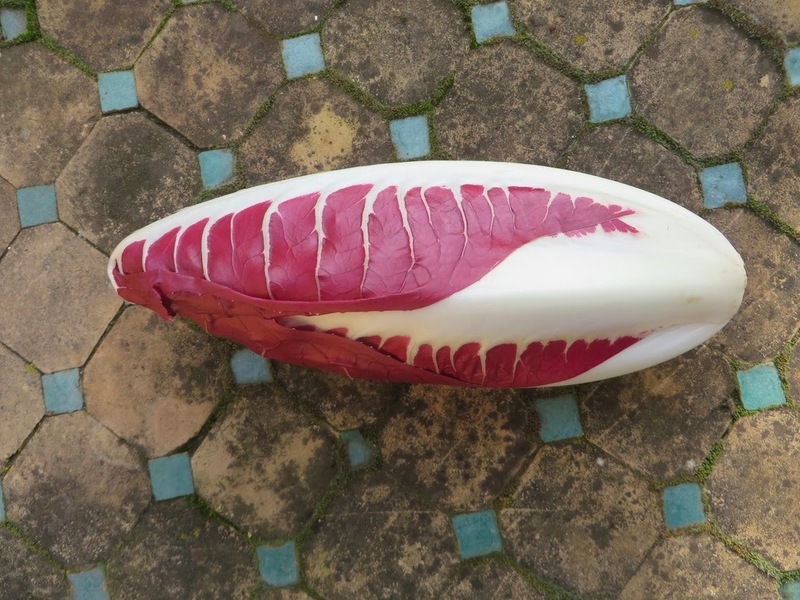 In keeping with the Season (and because I wasn't ready to deal with another horse) I went to the photo I took a few weeks ago of one of the Red chicories that are so loved here in the Winter. The image at the top was the Etagami I made to send to Japan. 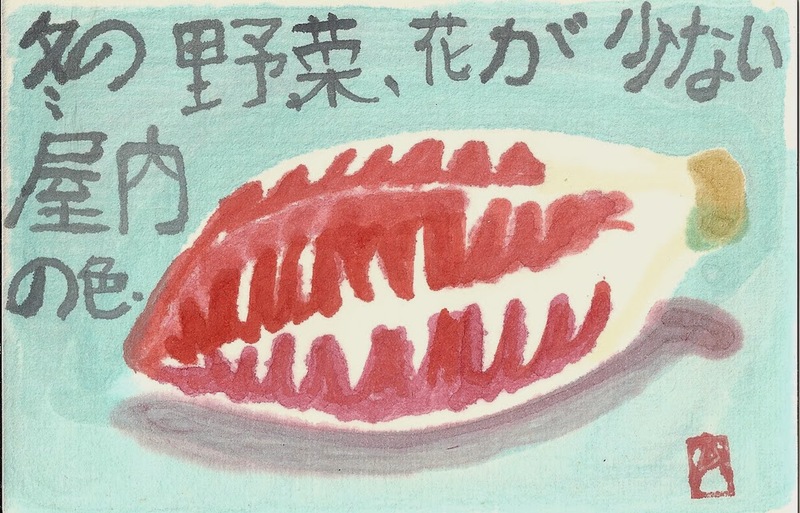 It was my 3rd try (controlling the bleed wasn't easy....) and writing the Japanese using the brush too was as awkward as it must look from my calligraphy. 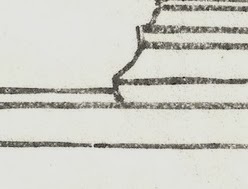 Here too is the preparatory sketch I did in my sketchbook with the English version of what I hope I wrote in Japanese (Thanks to Googletranslate I was able to play with different phrasings to get something I could write.). I love watercolors and will be doing more of these. Hopefully I'll get more skilled. If you Google: ETAGAMI and look at some of the examples, there are some that are really phenomenal. Here's a quick peek at the repaired line. 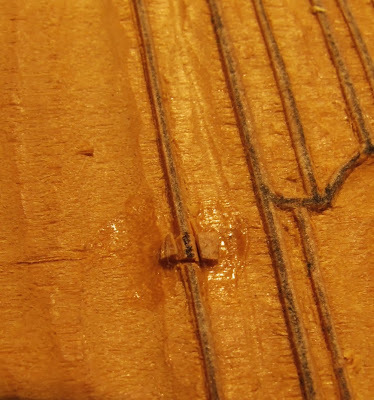 It's not perfect but it will be fine once the colors are added and it is likely that tiny gap on the left of the repair will close once the wood swells a bit after printing for a while. (I only hastily pulled 4-5 copies to check out how cleanly it will print). I won't post the finished keyblock impression. 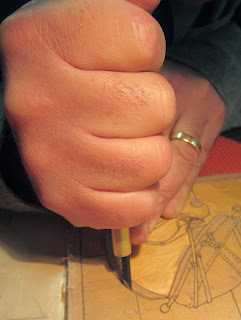 As most of my prints are defined by the drawing, if I show it now there won't be any mystery later. I printed up a few onto watercolor paper with sumi so I can test out some color ideas. I'm not there yet though as none feel "right" nor mesh well with the idea I have in my head. 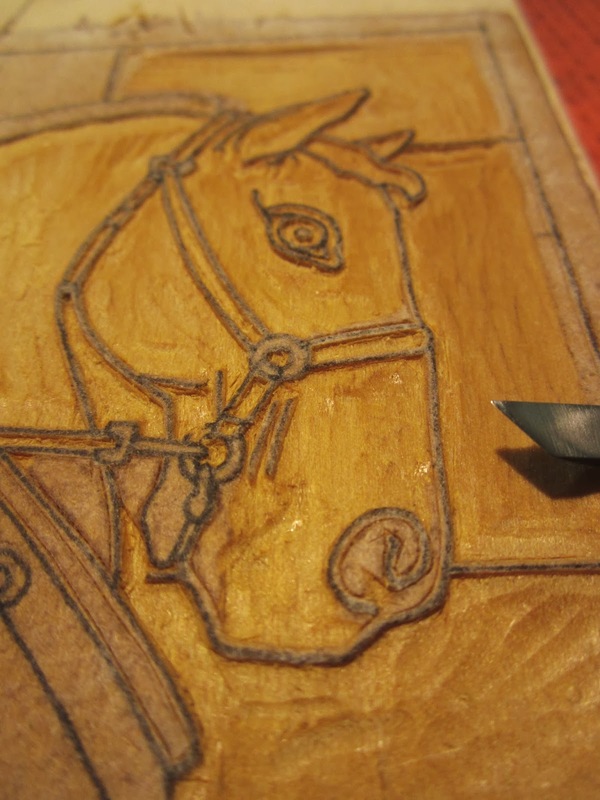 I still have a little bit of clearing to do on my little Year of the Horse print but I saw I had one small defect that was going to need a little repair. 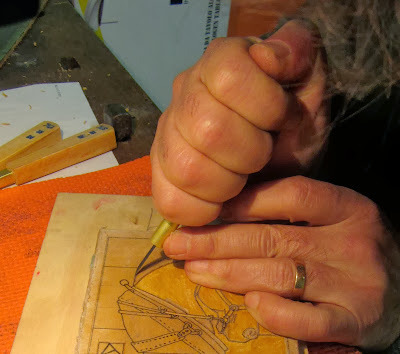 So before I quit for the day I shaved off a small piece of the surface wood from a corner of my boxwood block that wasn't going to be needed and trimmed it into a tiny, flat wedge shape. I then enlarged the lost part of my line a little bit (cutting either end to give me a clean edge) and then carefully set a drop of strong wood glue into the defect (but not on the wood that will be the printing surface). 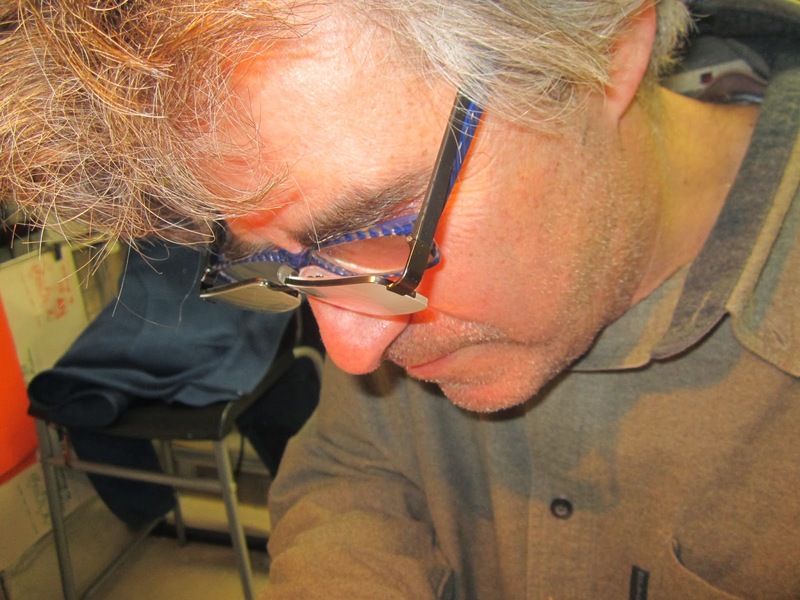 I carefully tucked into the defect the wedge, easing it into place with the end of a toothpick and then held it down with a flat piece of wood to dry. 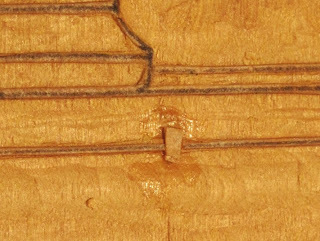 The next day I very gently cut it to match the previous line and then shaved the surface flush with the line using a flat chisel. This is ready to go. Unfortunately I did see ANOTHER small loss in another spot that might be too noticeable but I might wait to patch that until after I pull some proofs. Once I start carving the color blocks they'll be time to let the keyblock dry enough to do another repair. 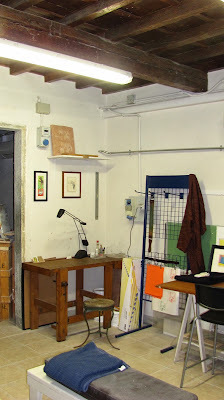 Nine months ago I posted to facebook (but not here) that I had taken a small room as a studio in Florence. But shortly after, the landlord sold it and although I could stay, the rent was higher than I could really justify. 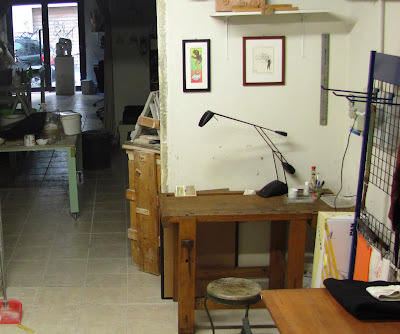 But I was using it and grateful to have a working space out of the house, as I was finally productive in ways I couldn't be at home. 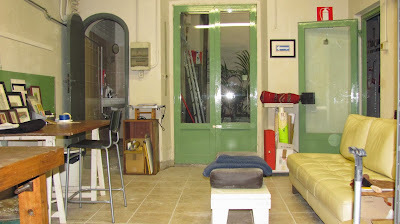 So when the neighbors Luca and Fabrizio, who have a cooperative studio where they also offer classes decided to empty and rent out one of their four rooms and asked if I knew anyone interested I said yes. Me. I've only just moved in and still have to get things organized. 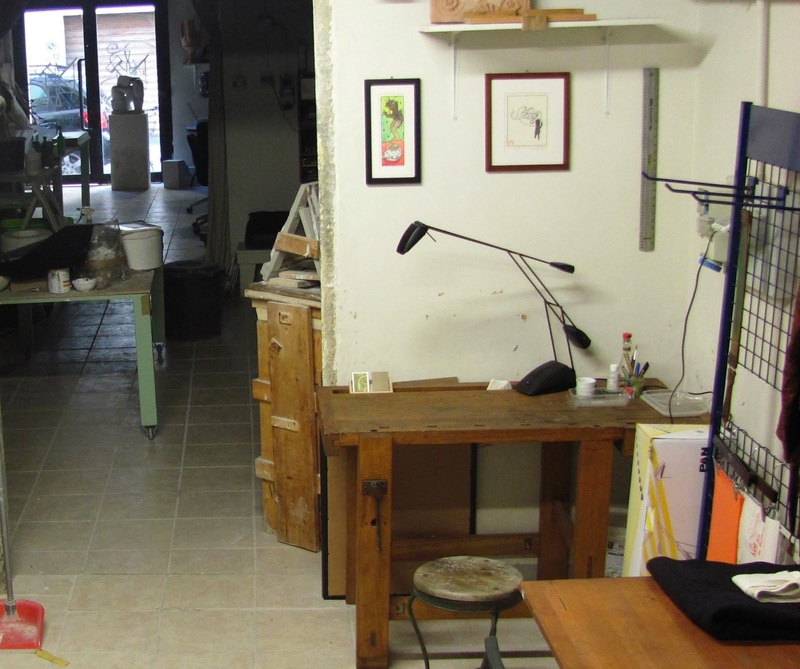 While the room I've moved into is a little smaller than I had before, the overall studio is large and I get access to communal tools, a patio, and the company of other artists. 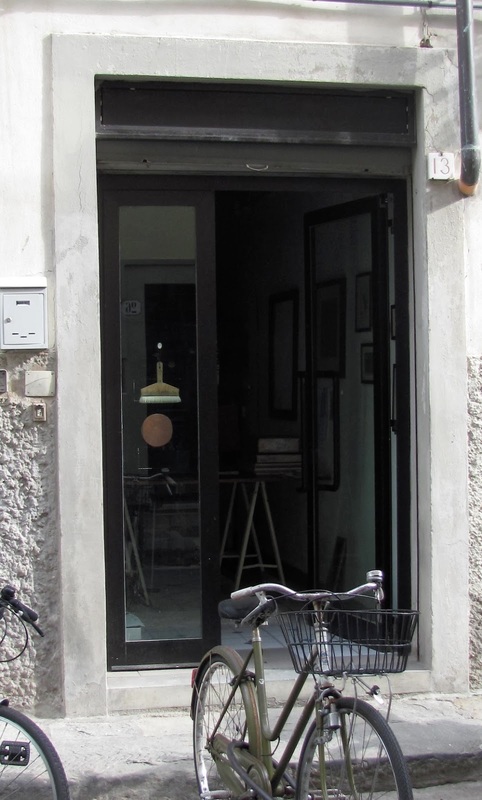 So I've moved from my cute, tiny studio at Via San Giovanni 13R to Number 25 on the same street. As moves go it was the easiest I've ever done. It is also at street level, on the same side of the street and only two doors down from my old one. But since the expenses are divided It's a little more than 1/2 of my previous rent. Via San Giovanni 25, Florence at the San Giovanni School of Art. I'm usually in the studio mornings. Oh. This was my old studio. I gave back the keys yesterday.